The PKK, which allegedly advocates "peace and democracy" and does not have a terror agenda, on Monday carried out two new bloody attacks on security forces in the southeastern province of Şırnak, leaving four police officers along with a soldier dead and eight wounded. The first incident took place in the Beytüşşebap district of Şırnak province, where the PKK terrorists targeted a military helicopter transporting personnel with rocket launchers. One soldier in the attack was heavily wounded before being taken to the military hospital in Şırnak. However, the soldier died despite medical efforts. The soldier, Doğan Acar, had just finished his military service and was on his way back home. Acar on Wednesday had posted on his girlfriend's Facebook page, saying "Seven days left sweetheart, seven days till we get together." The terrorist organization carried out its second attack on the very same day again in Şırnak, this time in the district of Silopi. A roadside explosion killed four police officers and wounded one. The officers were in the special operations team on their way to closing ditches dug out by the PKK. According to reports, the terrorists detonated a mine as the armored police vehicle was passing by. Seven soldiers who were wounded in the terrorist attack were brought to the Şırnak Military Hospital for medical treatment. On a separate occasion, two groups of PKK terrorists conducted simultaneous attacks on Monday morning with rocket launchers on the district police department and gendarmerie command in southeastern district of Lice in the Diyarbakır province. Following the attacks, one of the PKK groups had an accident with the car they were fleeing with right in the center of the district, and so they continued their escape on foot through the rural area. On the other hand, an armed clash broke out with the other group of terrorists and security forces. The armed clashes are reportedly ongoing in the district, with helicopters assisting the security officials in their operation. There is no reported case of injury or death as of yet, but the tradesmen in the district shut down their shops for now and locals have retreated to their houses for safety concerns. PKK's latest attack came on Monday evening around 7.30 p.m. as it targeted a police personnel vehicle belonging to Şırnak Police Department in a bombing attack in southeastern Turkey. The terrorists had planted a bomb on the highway in Şırnak and planned to detonate it just as the police vehiclewas passing.Fortunately, the terrorists mistimed the explosion and could not hit the vehicle. The rear end of the vehicle was slightly damaged but no casualties were reported. As deadly attacks spreading terror across the country continue, the terrorist organization is missing no opportunity to inflict damage. The terrorists have destroyed a bridge used for transportation by 10 different villages and three military units. The PKK has also been targeting infrastructure, which is causing great concern for the locals in the region. 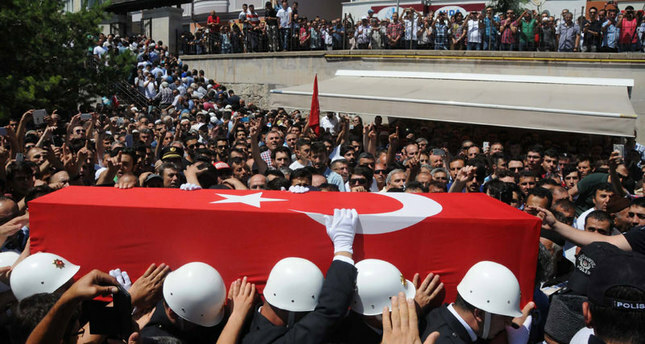 Having declared the end of the cease-fire on July 11, the PKK has intensified its terrorist attacks. Since then, nearly 30 security forces have been killed and more than 100 civilians, including three Iranians, have been injured. In retaliation, the Turkish Armed Forces have responded to the bloody terrorist activities, launching airstrikes in northern Iraq. Over the course of the operations in the region, nearly 400 terrorists have been killed and hundreds injured. In addition, all PKK hideouts have been destroyed. Ankara has reiterated its determination to eradicate all kinds of terror in the country. President Recep Tayyip Erdoğan on Wednesday explicitly underlined Turkey's resolute stance, saying, "Turkey will not remain indifferent to terrorist threats aimed at its national security." In the meantime, Prime Minister Ahmet Davutoğlu has also presented a strong determination to counter terrorist activities that are aimed at weakening Turkey. Davutoğlu on Saturday straightforwardly defied any organization targeting Turkey's national security, saying, "We have never supported conflict or violence, but if they think we will keep silent when they lay traps and kill our police and soldiers, I'm declaring here that whoever targets the public order will definitely be punished." Ankara's determined and effective fight against terror has received backing from all over the world. In a televised interview on July 27, Prime Minister Ahmet Davutoğlu stated that Turkey received support messages from 121 countries and organizations after the bloody attacks by the PKK, which is recognized as a terrorist organization by the U.S., the EU, NATO and many other international organizations.